There's a new Sheriff in town. It's time that Cactus Canyon folks had their own ranch to kick back on and share all things CC. So here is is the newest club on Pinside - The Cactus Canyon Club. I've been a member for quite a while. Added CCC package to make an awesome game. I agree. Eric did such a great job on CCC that I find myself playing it everyday. With the new system put in, it's like the last toast of the evening at a Bally/Williams pinball roast. You have modes put in there from most of the classic pins, such as AFM, MM, CV, SS, MB and TAF just to name a few. Heck, even Rudy from FH makes a surprise visit. 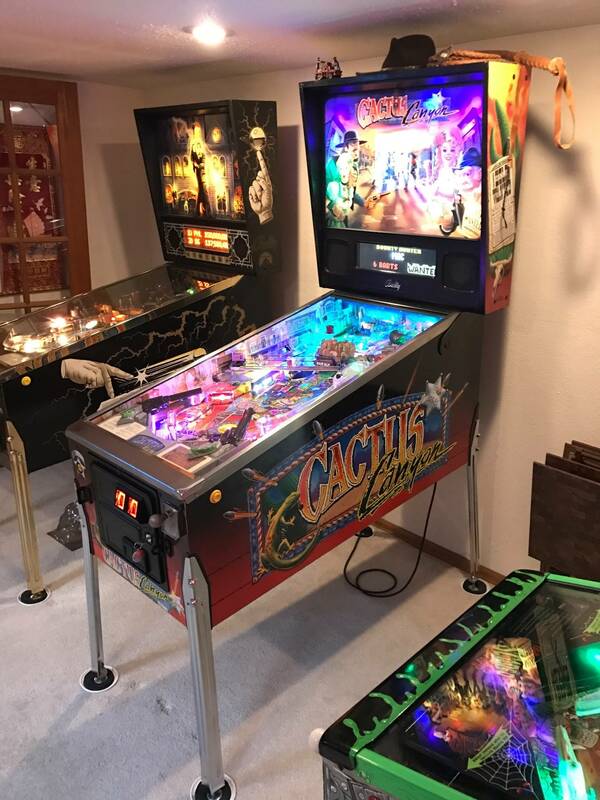 Gold mine multiball, drunk flippers, showdown, Save Polly(s), stampede and Marshall multiball, frank and beans, Cowboys vs Aliens........My god I can go on and on. It was costly, but I don't regret my decision at all adding CCC to my collection. If you played CC before but haven't got the chance to try out Eric's CCC, then you really missing out on one of Bally/Williams best. I have one since about 5 years now. Fun game. It's my daughters favorite. What parts do you need for CCC? somewhere a kit for sale? Im here, in the club, and ready to draw at high noon. I am a CCC also. I wonder what the CCC number is? How many of us there are? Hey, I have one of these. I'm in. So eric is there a lot of us. I totally understand if you dont want the number public. Contact Eric aka Epthegeek on Pinside email. He sells his P-roc system (which includes the sound board and a color DMD specs) to really make the game pop. Highly recommended. Of course a computer such as a Shuttle computer is needed as well. I designed a option serial number plate for the shooter housing, here is one pinsiders plate. PPS shut down this design but I designed a sheriff badge that you can add a number to. Finally found a nice CC Myself after many years searching. Is it normal for the hat to swivel around on the bad guy? I was told yes but it seems like it should just stay in one place. Would like to join the club with #811 even though my plaque reads #822. 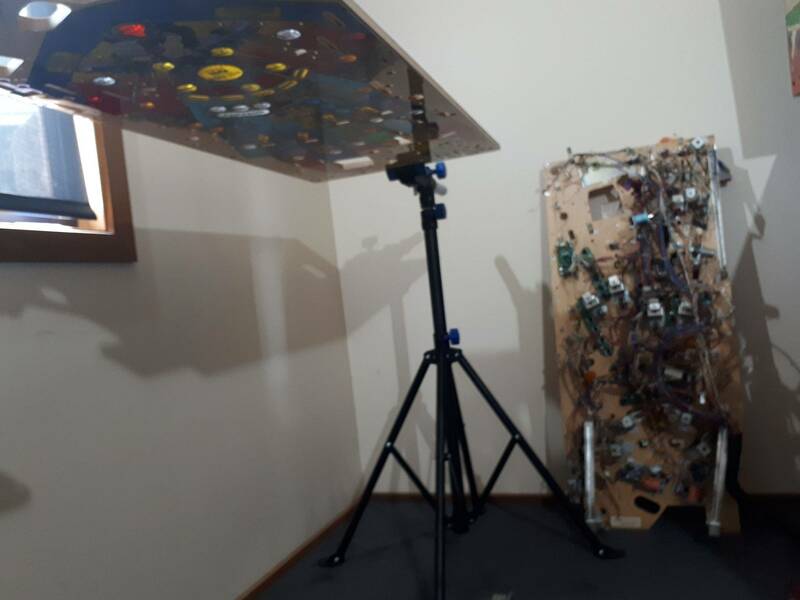 She's fully loaded with Led's , pinball pro speakers and backlit apron cards. The previous owner was nice enough to include the goodie bag contents, a new set of decals even thought the game was just redecalled and a CC lunchbox. I am going to need an ocd board for the GI strobing and have to shoot Eric a pm for CCC. 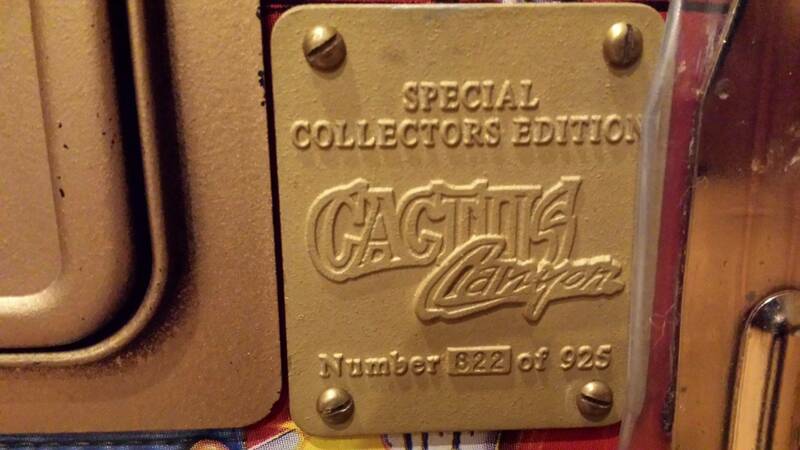 Pinball Plating and More (www.pinballplatingandmore.com) and Planetary Pinball Supply (PPS) announce availability of Cactus Canyon serial number plaques. 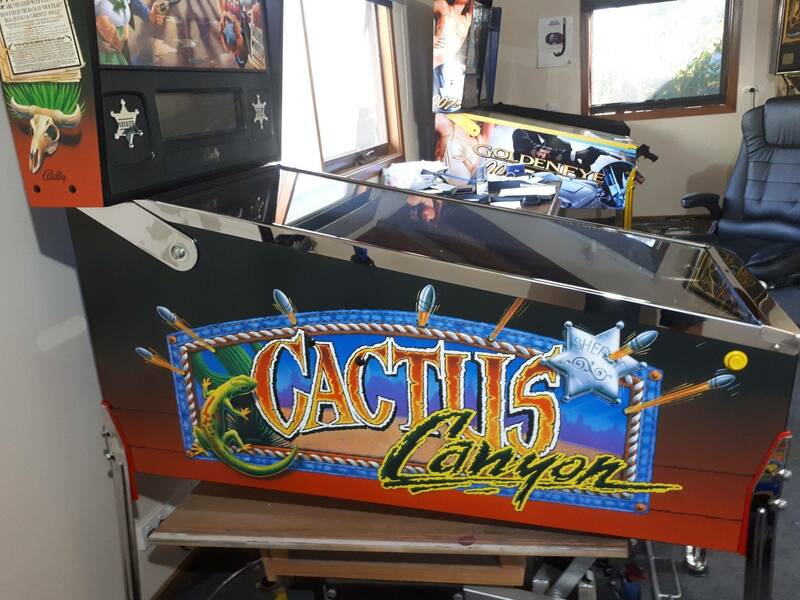 PPS has partnered with Pinball Plating and More (PP&M) to make available Cactus Canyon serial number plaques with some new plating options. PPS had contracted with the original supplier who had original molds for the plaque to produce more plaques, and these are available now. 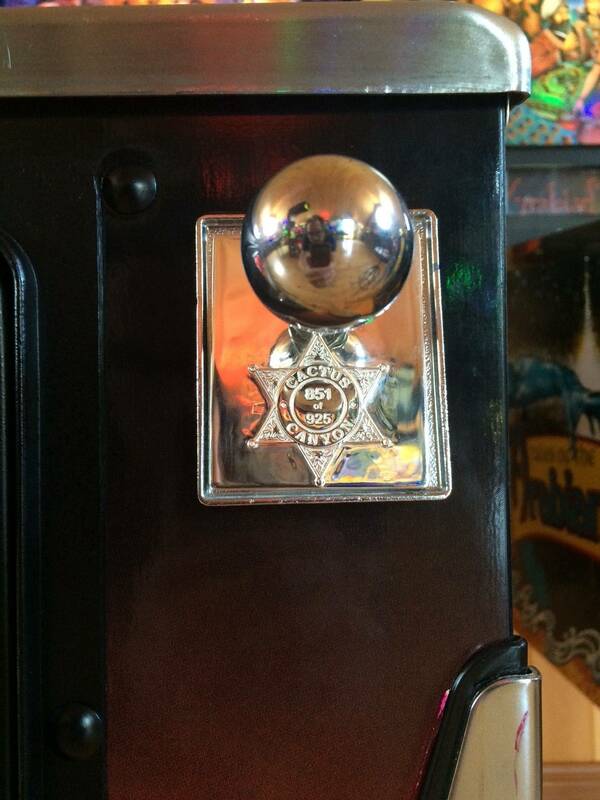 Pinball Plating and More will provide custom serial number engraving as well as provide additional plating options in Polished Brass, Silver, and Gold 24K in addition to the original dull satin brass finish. Both engraved (with serial numbers) and without will be available. 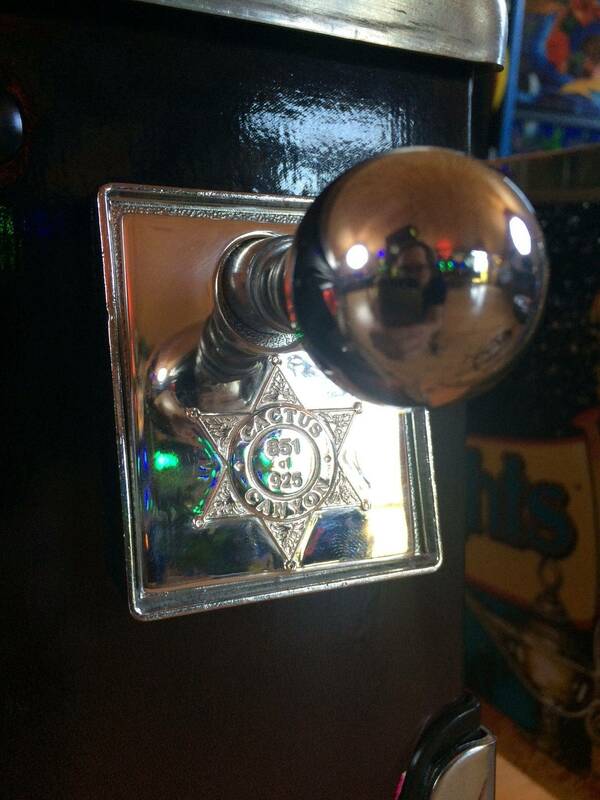 PPS (www.planetarypinball.com) will have on it’s website un-engraved plated plaques in all 4 plating options, and http://www.pinballplatingandmore.com will be the sole provider of engraved plates which can be in a variety of plating options as well. 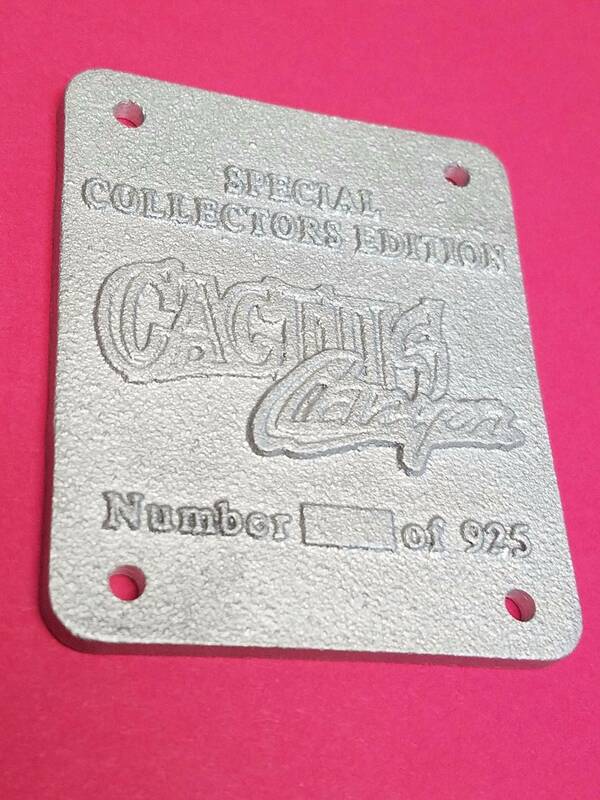 Customers can order multiple plaques with their serial number in different plating colors if desired. Also – matched mounting screws will be available for $9 (set/4) which will be plated in any of the 4 plating options to match the serial plaque plating if desired. 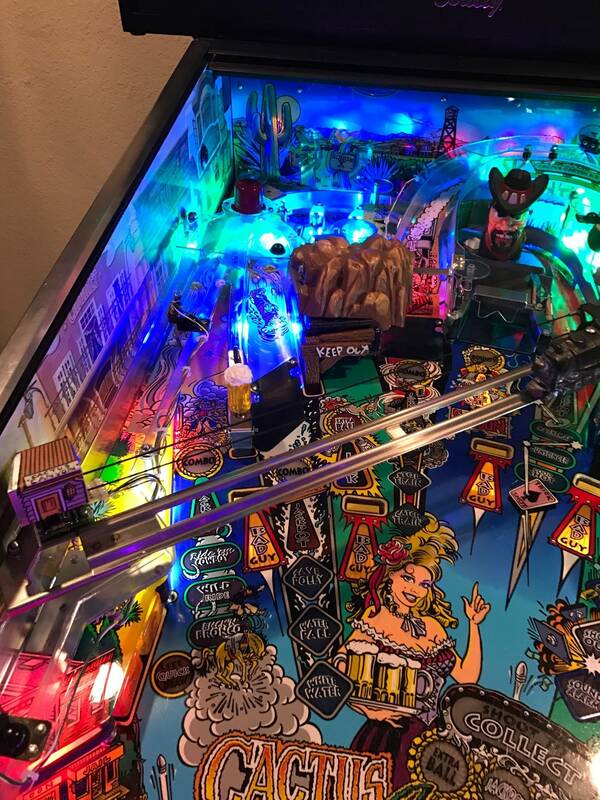 Note: for ENGRAVED (with your serial number) these are available only from Ron Woodard at Pinball Plating and More (orders@pinballplatingandmore.com) – for Not engraved these will be available from either PPS or PP&M – plates are in hand and will be available on each store very soon. Thanks to all for your interest and we are happy to finally make these available. So we will order through your website. When will this take place? 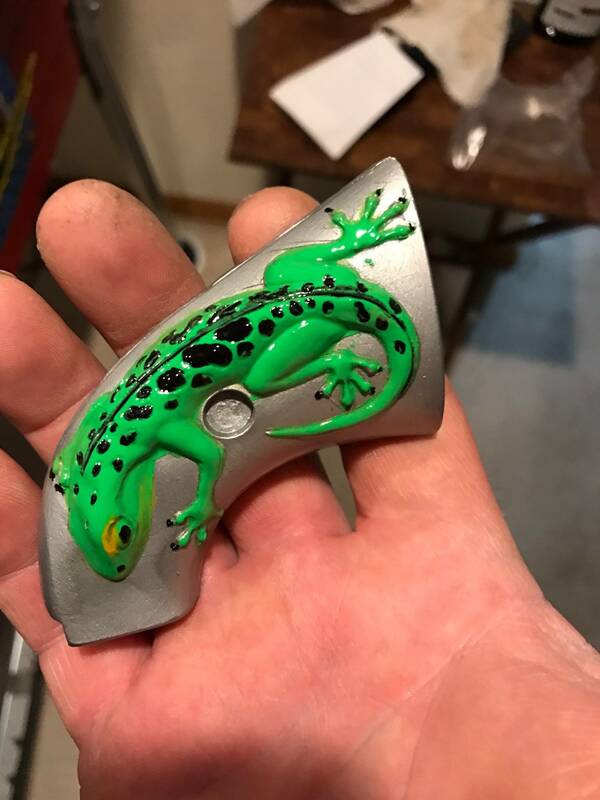 Just need to know what finish you want and your number. 1) The spring that's inside his head, and keeps his face from resting on the switch. I think I've found it in the bottom of the game, and re-installed with a #4 machine screw and washer to the tiny post on the left inside the bracket, but it keeps working its way loose and falling out. 2) I feel like his face should swing freely on the axle, but it seems to hug the metal bracket and stick in whatever position you put it in. 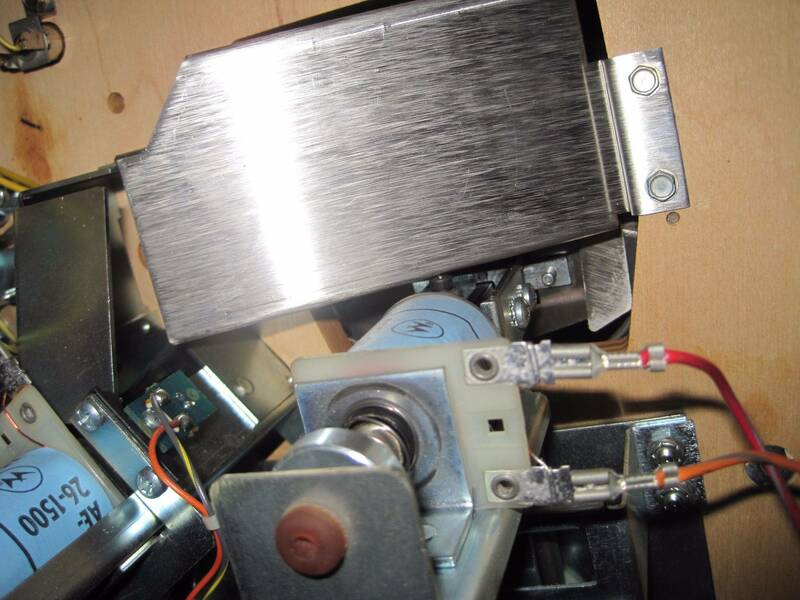 3) On our game, his hat is attached to a long post, which runs through a small bracket welded to the toy support (above the playfield), then continues below the playfield and ends in a "foot" made of a metal slug screwed to the post with an allen screw. This seems like a weird design, because the foot is actually long enough to get jammed in the bottom of the support bracket if it were to turn sideways - and even when it's properly aligned, it's just sort of sitting on the plunger of the coil that launches it. See the attached pic. I have a set of Tilt Graphic game blade graphics, western town style. It looks like you might be missing the flat guide plate with the square hole in it that the square shaft runs up and down in. Click on my pic and enlarge it. In my pic follow my square shaft up and you can see the plate with the square hole in it. That's what stops the shaft from turning. If you have your manual, page 2-25 Bad Guy Mech Assy, It's hard to figure out, but Upper drawing of the bottom view, # 45 the machine screw goes through it and if I'm not mistaken, it could be #44 01-15155 Bad Guy assy bracket stop but I could be wrong too. You would be able to see it better if they had a front view, but unfortunately they don't. Good luck and enjoy your CC. eggbert52 This should answer your question too. Im in with CC #343! Didnt know til now there was a CC club. I have had my game for about 6 months now. It has CCC and I love it! Eric did a great job with this and I appreciate it! Lookin to get a number plate for it (an engraved original) I have added a few mods. Prosound, playfield protector, I did a LED flasher relocation for the guns (mount the flashers in the end of the barrel) provides a nice flash out of the end. Installed a couple of the AFM aliens with lighted eyes in the back of the pf on the left near the pops. Added the led rings to pop caps so the look like mini saucers. Town pinblades. Oh also the lighted Beer Mug! I am planning on upgrading my CC to a CCC. I've seen solutions in the backbox, where the amplifier, danesi board and the computer have been attached to a metal plate. Those apparently are custom made and not a universal fit for different computers etc? I have not ordered the danesi board as my friend makes something similar for me. Meanwhile my plan is that I will take the power from regular house power outlets. Then later I get a friend over to power the computer, amplifier and display from the pinball. I wonder what is the best location for the computer etc. - I guess it would work now so that if I manage to attach the equipment to backbox, I would leave the backglass away, so that I can manually power up and down the computer? I bought a tiny computer "beebox" and I am wondering which OS I should install. The guide on pinside gives specific info on what to do with a Win7 install, but is there a reason not to use Win10? Also, I had a look at the beebox and it seems I cannot find the EuP-option where the danesi-board faq makes a reference to - is there other suitable power options in the computer to ensure the shutdown and power-up of the computer? I think you should PM epthegeek with those questions. Eric can give you the best answers. 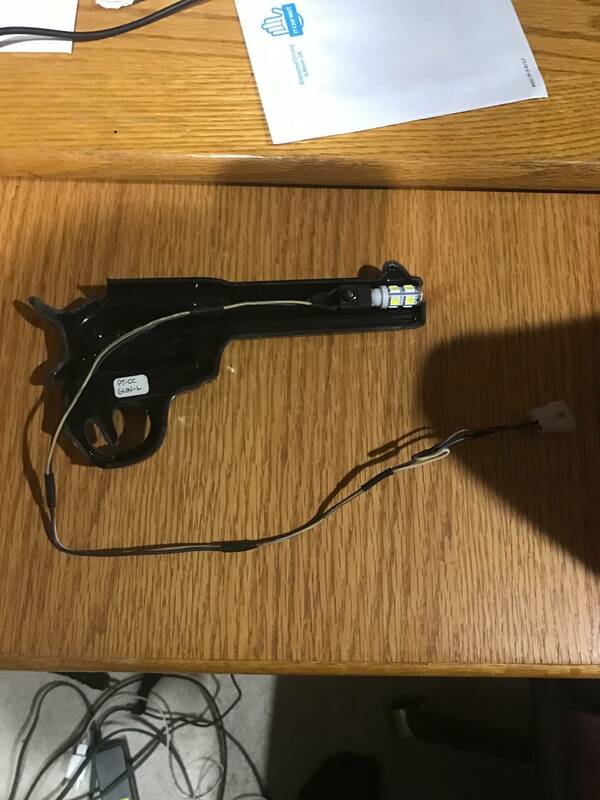 Eric's system (kit) works perfectly (powers up and shuts down just like a normal Pin would. That is a must for me as the other system CCEE has to use a remote control to power up the computer. 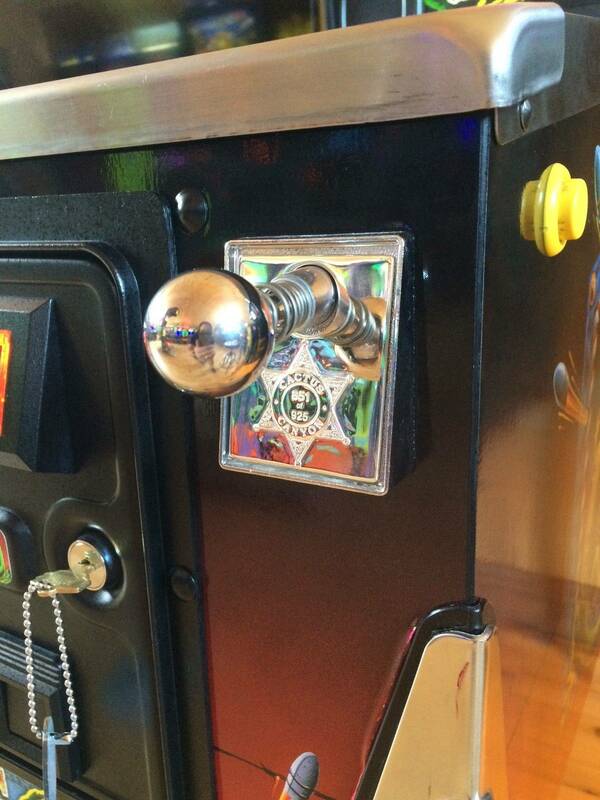 (nice for a game console but not for a pin) My suggestion would be to go with what works! Just finished new cabinet art, added a chrome door,highly polished chrome rails, back box hinges and lockdown bar. New playfield next, should come up a treat. Any advices from the Club? Wow that's culture shock from GB! We are eagerly awaiting an update from Eric for Continued so that's something to look forward to! But the GB Themen grabs me more then the Western theme. Both have their pro and cons and the gameplay is still superb on both. Ugh, the train motor on my (borrowed) CCC has started making a terrible screeching noise... anyone else seen this? Any suggestions how to fix? Try a little teflon grease on the plastic gears. Typically these gears do not require lubrication but I have seen some high frequency vibrations from these gearboxes probably caused by gear clearances. A little lube dampens the vibrations and makes them quiet down. I had this same thing happen to my Mine motor. I live in Denver and it is extremely dry here. So I removed the motor and just used a drop of 3 in 1 oil to lube the armature bearings (each end of the motor shaft) That did it! Those bearings will dry out and get dust in them. Thanks guys. Will do both of those suggestions and let you know. wondering what rom you are running,please. I only just got it running again last night. 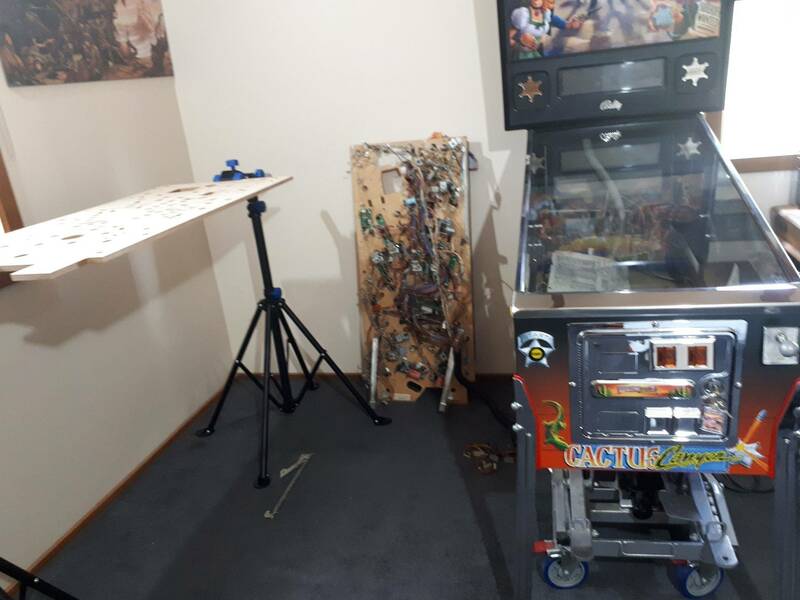 Had heaps of niggles and adjustments to make after I put the new playfield in. Small electrical stuff, that I sent it away to get done by a pro. So after a very long process, she looks amazing and plays perfectly.well worth all the time and effort. I will seriously consider CCC, now it is as good as it can be. When I get home in an hour I will look at my cpu card and what version I have. My game came with Continued so I have not used the the factory firmware but I have it. Did you ever play the original? I assume you think CCC is the only way to go? Yeah Rich my software is 1.04 as well. I have played the original on my buddy's game. CCC is worth every penny. It blows the original away. Eric has the kit that has all the boards and computer. Highly recommend it. It will breath new life into your CC for sure. Has someone also the issue that the flippers feel a bit weak, and so the mainramp is hard to hit? I did a flipper rebuild and now it rocks again. 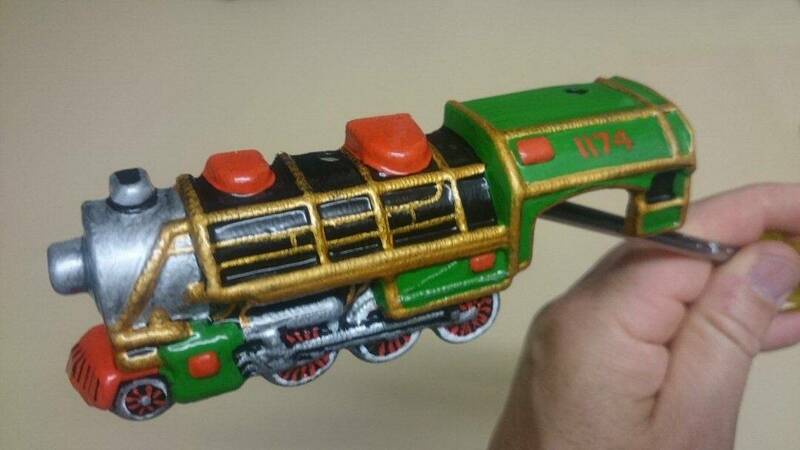 Has anyone had trouble with the Bart head getting stuck to the left? Once my mechanism moves to the side, he stays there and balls get stuck between the metal plate and the guide on the right. He still reacts when the ball hits him. 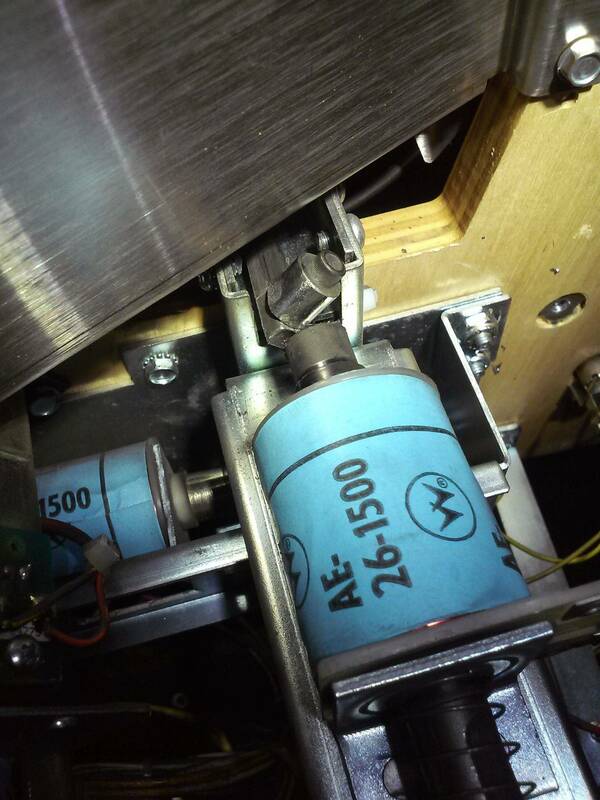 The coil moves freely, I've replaced the spring on the mechanism, and I've made sure the game is level. Any suggestions? Can anyone tell me how to contact Eric ? His handle is epthegeek just PM him.